Although Castro considered enrolling at Columbia University, a private university in Manhattan, he returned to Cuba to complete his degree. Castro started to have money problems. He refused to go work and others had to pay the family's bills. The relationship with his wife was also strained. In 1950 he graduated from law school with a Doctor of Laws degree and began practicing law in a small partnership in Havana. By now he had become well known for his passionately nationalist views and his intense opposition to the United States. Castro spoke publicly against the United States involvement in defending South Korea in the Korean War. At the university, Castro joined groups opposed to the government. He received his law degree in 1950 and planned to run for a seat in the legislature, but his plans were frustrated when Batista overthrew the government and stopped the elections. 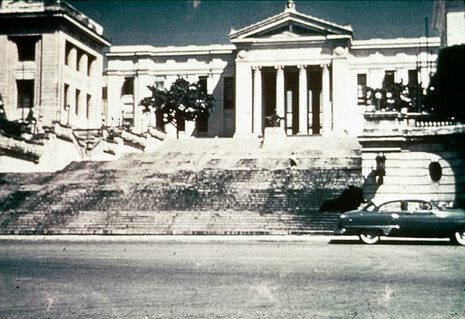 Fidel entered Havana University at 19 years of age, in the Faculty of law. According to President Batista, Castro killed two men during his student days. Fidel was also accused of being a Communist since his student days. According to Herbert L. Matthews, Fidel was a typical example of a young Cuban of good background who, because of lack of parental control or real education, became a full-fledged gangster. After graduation in 1950, he began a law practice, defending men and women who were considered victims of social injustice. At this time, Fidel was standing for the election to the House of Representatives of Havana.